Halloween has become kind of a secular "holiday." Do we know its origin? It comes from a pagan feast of the Celtic people. It was called Samhain, the god of the dead. On October 31 and November 1, the ancient Celts would celebrate the beginning of winter and the end of the harvest. They would give tribute to Samhain. They believed that during this time the spirits of the deceased could roam the land causing mischief. These ghosts would be appeased with treats, and they could be frightened away with carved turnips and bonfires. Through the passage of time, this feast lost its pagan religious roots and became the costumed celebration it is today. Pumpkins have replaced turnips. Treats are given to kids and not ghosts. The Church Christianized this feast of the dead in the 9th century, just as the pagan feast of the saturnalia was Christianized as the celebration of Christmas from December 25 through January 6. This was a way of helping the Christians who spread so rapidly to pray and to understand and celebrate the faith. So, on November 1 we have All Saints Day. The night before was called All Hallows Eve, whose contraction is Hallowe'en. The purpose was and is honoring the Saints: those faithful departed who are in Heaven beholding God face to face (the Beatific Vision). The day after, November 2, eventually became a day dedicated to those departed faithful who have not yet reached Heaven. They are in purgatory. On this day, All Souls Day, Catholics gather together in Churches throughout the world to pray in the Holy Mass for these brothers and sisters who no longer can merit for themselves but rely upon us for prayers. The Halloween tradition is harmless unless it is used not for fun, but to glorify evil. 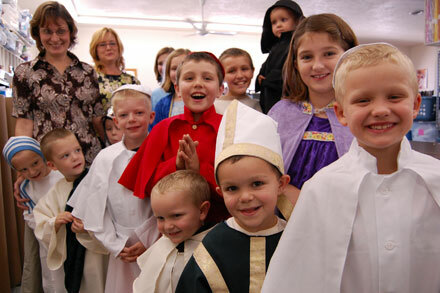 Although I do not see this happening in the near future, it would be a great teaching tool if kids got dressed up like their favorite Saints and learned something about them in the process. It would be nice to see a St. Theresa, St. Joseph, Moses, etc. with their bags for treats or even alms for the poor. Above all, this is the time to remember both the Saints and the holy souls in Purgatory. We ask the Saints to be our prayer partners so that we too may get to Heaven one day. We also pray for the deceased that their sojourn may end soon so that they will behold the Face of God.